— John Gruber, creator of Markdown. Markdown is a simple formatting syntax inspired by plain text emails. 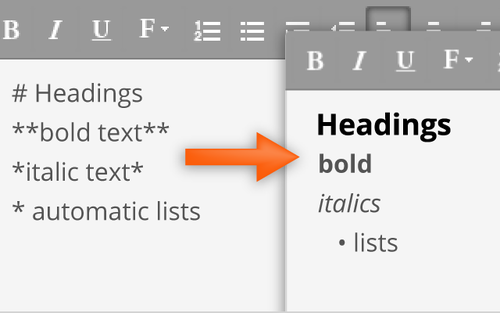 With markdown, you can format your text without using the mouse, remembering complex commands or diving into code. It is a natural fit for Textbox.io – we want to keep you focused on the task at hand: writing. Textbox.io takes the markdown concept one step further. Upon entering markdown, the Textbox.io editor instantly translates the markdown into the intended formatting. Is translated (upon pressing the enter key) to a heading tag. For a full breakdown of markdown syntax supported in Texbox.io, check out the help dialog within the editor. You can create hyperlinks, insert images and more.